Do you know the flood risk to your home? Flooding is New Zealand’s most frequent natural hazard and causes significant social, environmental, and economic costs. How is your council managing their stormwater systems to reduce the risk of your home flooding? At the start of 2017, my then pregnant wife and I were looking to buy a house in Wellington. I can’t remember how many open homes we went to, but I do know we looked at a lot of houses in quite a few different suburbs. In some cases, we would walk in and know straight away that we wouldn’t be putting an offer in because something was obviously wrong. One of the most memorable for me was a house where the kitchen floor had quite a significant slope, like the ground had sunk underneath it. In other cases, we would read the builder’s report, and decide that there was too much work to be done to get it up to scratch. Eventually, we found a house that we liked and, more importantly, could afford. 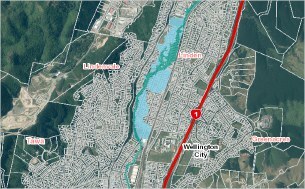 It wasn’t until I met with Wellington Water, as part of the Managing stormwater systems to reduce the risk of flooding performance audit, that I realised we hadn’t considered something pretty major – the risk of our house flooding. My first thought was something that I’m not allowed to repeat here. If our house was in a high flood risk area, we would be more likely to experience flooding, and the cost of insurance would be higher. According to the Insurance Council of New Zealand, severe weather and flood events resulted in claims costing about $260 million in 2017/18. And it will only get worse with climate change. I didn’t know where to look for this information until I spoke with Greater Wellington Regional Council a week later. They told me about how I could search for the flood risk to my home using their mapping website, which uses information from the regions’ councils. As soon as I got back to the office, I looked up our address. Thankfully, our house was not at a high risk of flooding. In my job, you often gain a new appreciation for things you never really thought about before. Lately for me, it has been the importance of councils effectively managing their stormwater systems to reduce the risk of homes, property, and businesses flooding. Stormwater systems are the unsung hero of urban infrastructure – and we should all care about how they are managed. How often is my house likely to be flooded by stormwater? How much protection from flooding is the stormwater system going to give me? What actions can I take to reduce the amount of stormwater run-off from my property? Is the stormwater system delivering the level of protection it was designed to provide? How is the council working to address any issues in delivering the intended level of protection? Question: What is four plus four ?